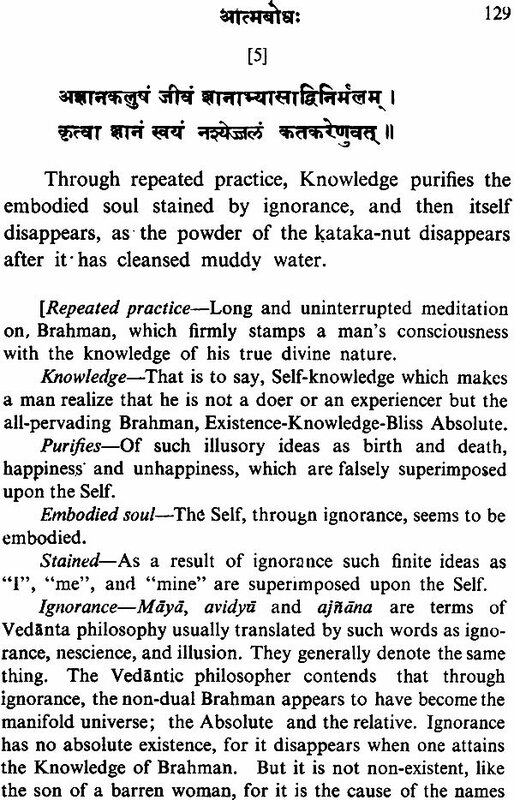 This volume is a reprint of the American edition of Self Knowledge an English translation of Sankaracarya’s atmabodha with notes comments and an elaborate introduction by Swami Nikhilananda of the Ramakrishna Vivekananda centre of New York. 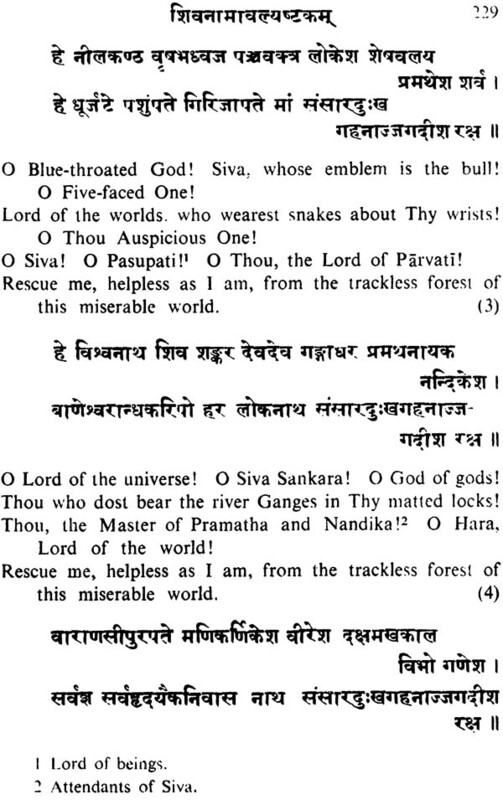 The free and metrical renderings of some of acarya Sankara’s devotional hymns which have been appended to his short treatise on Advaita Vedanta serve to draw the attention of the readers to the less well known aspect of Sankara’s personality his deep devotional approach to the gods and goddess of popular religion. 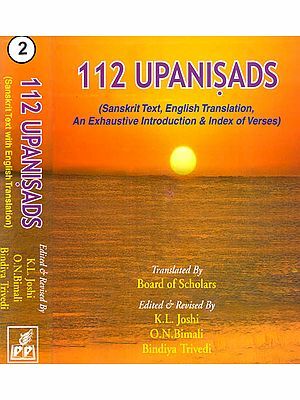 In this Indian edition the original Sanskrit texts have been added which we hope will be useful to the Sanskrit knowing readers. 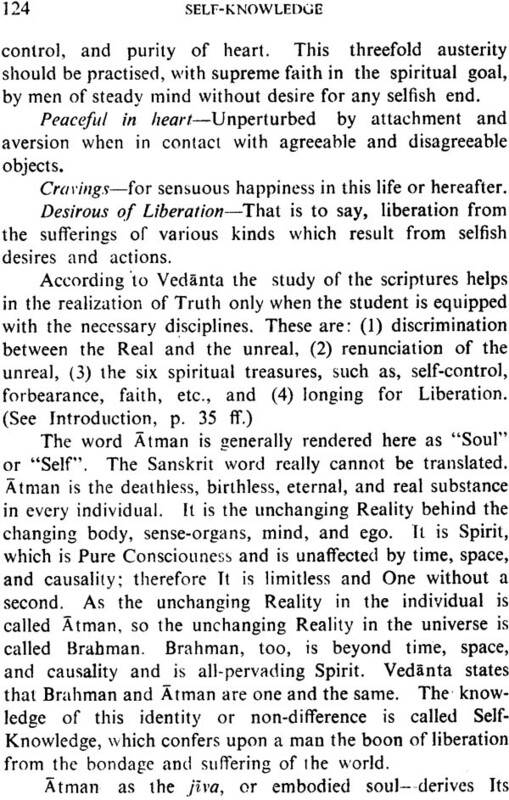 The Atmabodha or Self-Knowledge, is a short treatise on Advaita Vedanta, the philosophy of Non-dualistic Vedanta. It consists of only sixty eight verses in melodious Sanskrit, and is believed to have been composed by Sankaracarya, the great philosopher of Non-dualism. According to the generally accepted modern view, Sankaracarya, or Sankara, was born during the eighth century after Christ, in the village of Kalai on the west coast of South India. He belonged to the simple, scholarly, and industrious Namagdri sect of brähmins of Malabar. After completing the study of the Vedas, he renounced the world at an early age in quest of Truth and was initiated into the monastic life by the great ascetic Govindapda. Presently he devoted himself to the practice of spiritual austerities, meditation, and yoga. Before long Sankara’s spiritual genius and intellectual acumen were acknowledged by the leading philosophers of India. He engaged himself in reforming the Samoana Dharma, the Eternal Religion of the Hindus, and with that end in view wrote commentaries on the Bhagavadgita, the Brahma-sütras, and the principal (Upanisads. He became the personification of the wisdom of the Vedas. He traveled the length and breadth of India, preaching the divinity of the soul and the oneness of existence. Before hi death at the age of thirty-two at Kedarnäth, in the Himalayas, Sankara had established monasteries at Sringeri (Mysore) in the south, Purl in the east, Dvarakà (Kathiawad) in the west, and J0Ø Math (the Himalayas) in the north, and had placed four of his gifted disciples, each well-versed in one of the four Vedas, in charge of them. He reorganized the ancient Vedic order of sannyasis and assigned to if the spiritual leadership of Hindu society. Sankara lived during the decadent period of Buddhism. Hinduism was beginning to reassert itself but true leadership was lacking. The country was honey-combed with conflicting sects; a spiritual confusion reigned everywhere and people were perplexed. Sankara’s work, at this critical time, was the salvation of the Vedic culture. He met opponents from other schools in open debates, refuted their views, and re-established the supremacy of Non-dualistic Vedänta. In the midst of his ceaseless activities he found time to write small philosophical treatises and compose hymns in praise of the Hindu deities in order to quicken the longing of aspirants after the spiritual life. In him one finds the unusual combination of philosopher and poet, savant and saint, mystic and religious reformer, debater of rare forensic power and passionate lover of God. There exist three great misconceptions regarding Sankara’s philosophy, both in India and in the West. The first of these is that he discourages the performance of duties and advocates the discipline of non-action for the realization of Truth. Sankara’s position regarding action and the performance of duties may be briefly stated. The nature of Atman, or the Soul, is Existence-Knowledge-Bliss Absolute. It is the very embodiment of Peace, Desirelessness, Perfection, Truth, Beauty, Infinity, and Eternity. On account of mãyä, or ignorance, man has forgotten his true nature and finds himself entangled in the relative world of good and evil, pain and pleasure, life and death, and the other pairs of opposites. From the cradle to the grave, the unlimited soul engages in ceaseless action, striving to shun evil and realize the good. But his activities are influenced by love and hate, attachment and aversion, and he hopes to experience, through action, infinite and eternal happiness in the outside world. He roams aimlessly in samsara, the world of change and becoming, rising or falling according to the results of his action. Only gradually does he discover the impossibility of attaining abiding happiness through work associated with I-consciousness and the desire for results. Infinite blessedness is not possible through any finite action governed by the law of cause and effect. Then he learns from his teacher and the scriptures that karma (work), in order to produce a spiritual effect, must be performed as yoga; that is to say, the doer must regard himself as an instrument in the hand of God, surrender to God the results of action, and remain unruffled by love or hate. Work performed in this spirit purifies the heart and makes it inclined to the cultivation of meditation and Self-Knowledge. Gradually, outer action drops away, reduced to a minimum sufficient only for the maintenance of the body. The actor remains satisfied with what comes of its own accord, without feeling attachment to the agreeable or aversion for the disagreeable, devoting himself heart and soul to the contemplation of Atman, which is the sole Reality. By means of Knowledge, or jtlãna, he at last realizes the true nature of the Soul, attains peace, and is liberated from the endless suffering of the world. The liberated man engages in service to humanity, but his activities are quite different from those of an unlimited person. He is free from I-consciousness and the longing for results. He never loses the Knowledge of Atman. in his actions he recognizes the influence of the gunas, which constitute man’s physical nature. At their bidding the organs perform actions; but the soul is always immersed in peace. Thus, though appearing to be active, he is really action less. He sees non- action in action. If the Soul is identified with action even to the slightest degree, It has not realized its true nature. Secondly, it is contended, especially in the West, that because of Sankara’s staunch loyalty to the Non-dualistic ideal of Brahman, or the Absolute, he is an enemy of the gods and goddesses of popular religion. Undoubtedly he held Ultimate Reality to be beyond name and form and of the nature of Pure Consciousness. He also stated that the direct method for realization of Brahman is. not worship, but the path of knowledge, which consists in hearing the instruction of a teacher, reflecting on its meaning, and lastly, meditating on Truth with single-minded devotion. Philosophical discrimination (viveka) and renunciation of the unreal (vairagya) constitute for Sankara the basic disciplines for realization of Brahman. Yet he was aware that few aspirants are strong enough to climb this steep path. The majority require a tangible symbol of Truth, anthropomorphic or otherwise, and also a human relationship with a Personal God. For them prayer and supplication form an indispensable part of worship. Out of compassion for these seekers Sankara composed many hymns in praise of such popular deities of Hinduism as Siva, Viz, and the Divine Mother, As one reads these hymns, one is impressed by the magnanimity of Sankara, who, having attained the highest vision of the Absolute, brought himself down to the level of ordinary worshippers smitten with the idea of many transgressions, assumed their attitude of insignificance and helplessness, and prayed to the Lord for grace to attain liberation from the many miseries of earthly life. 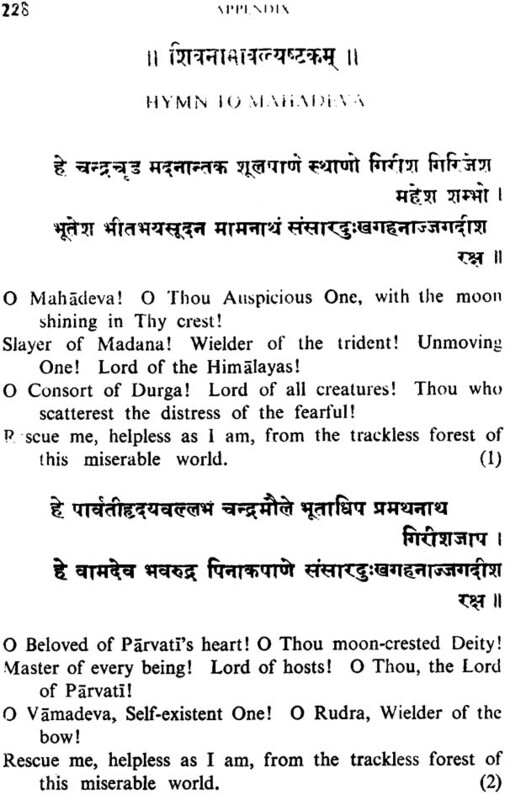 These hymns are recited daily by countless devotees all over India at times of prayer and worship. A few of them are given in the Appendix of the present volume, along with several others of a Non- dualistic nature. They will demonstrate the grand sweep of Sankara’s mind. Through all the hymns, dualistic or monistic, is expressed the longing of the devotee for freedom from ignorance, which alone is responsible for suffering in all its forms. Even in his theistic hymns Sankara never permits one to forget that Brahman alone is the foundation of all relative ideas and that the effulgence of Pure Consciousness radiates through the vesture of name and form. The devotee catches a glimpse of the Absolute through the form of the Personal God, who is the highest manifestation of the Infinite that a finite mind can comprehend on the relative plane. Sankara reiterates this principle in his philosophy. The beginner learns the art of concentration through worship of the Personal God (Saguna Brahman) and acquires purity of heart through performance of unselfish duties. Endowed then with concentration and purity, he sets himself to the task of acquiring the Knowledge of Brahman and realizes, in the end, the Impersonal Absolute. Sankara initiated the worship of Sakti, or the Divine Mother, in his monasteries. Thirdly, it is said by some of Sankara’s Western critics that he moved away from the teachings of (he seers of the Upanisads. The Upanisads, these critics contend, hold forth an optimistic and affirmative view of life, whereas Sankara, through his doctrine of mäyä, describes the world as a snare and a delusion. His philosophy is regarded by them as pessimistic and negative. That this charge is without foundation will be realized by readers of the introduction and the text of this book. It is to Sankara’s everlasting glory that he points out through unimpeachable reasoning the spiritual nature of the world and he individual soul. Sankata takes every opportunity to insist that the true essence of man and universe is existence knowledge bliss absolute. It is only when the individual sees a difference between Brahman and himself and the universe that he becomes a victim deluding names and forms as maya and the injunction to renounce the unreal as a means to realization of truth are not new ideas of Sankara’s but are both explicit and implicit in the Upanisads. I have deemed it necessary to write a rather lengthy introduction to the present book in order to give an outline of Non dualistic Vedanta philosophy. Many things discussed therein may be unfamiliar to the average western reader and therefore difficult to comprehend but with a little labor and concentration the contents will become intelligible. It will be helpful to understand the method by which the starting conclusions of Vedanta have been reached. Some of these such as the ideas of the divinity of the soul and the reality of the absolute have become part of common human knowledge. Yet western scholars often think that Brahman is either a dogma of the Hindu theologians or the private experience of the Vedantic mystics and that it can never be proved by the rational and experimental methods of philosophy. Vedantists on the other hand contend that Brahman is either a dogma of the Hindu theologians or the private experience of the Vedantic Mystics and that it can never be proved by the rational and experimental methods of philosophy. Vedantists on the other hand contend that Brahman is neither a dogma of religion nor a private mystical experience but a metaphysical truth based upon universal reason and experience. Vedanta is a systematic philosophy and aims at the demonstration of ultimate reality with us much reason as can possibly be brought to the understanding of the problems of transcendental truth. A careful study of Vedanta will reveal that it not only makes room for many conflicting opinions of intellectual philosophers but also dares to indicate their ultimate synthesis. Vedanta is the foundation of the spiritual culture of India. It has kept Hindu society alive for the past seven thousand years. It is the philosophy of all the important religious seets and groups. In its various phases Vedanta represents the progressive thought of man beginning with Dualims passing through qualified Non Dualism and ending in absolute non dualism the doctrine of the total identify of the subject and object beyond which human reason thought and experience cannot go. The conclusions of the non dualistic philosophy are epitomized in four statements the importance of which is felt as keenly today as when they were first revealed tot eh ancient Indo Aryan seers living on the banks of the Indus and the Ganges. They are namely the divinity of the soul the unity of existence the oneness of the Godhead and the harmony of religions. Every soul is divine though during the state of ignorance it remains oblivious of its spiritual nature. While sojourning in the relative world it assumes various bodies and identifies itself with them. It is then regarded as a finite creature. But in the heart of every individual the divine light shines with undiminished lustre. Hence all men are entitled to out respect. The divinity of the should is the unshakable spiritual basis of democracy self determinatives, freedom, and other aspirations of modern minds. Even a noble human ideal when guided only be expediency can be an instrument of oppression and exploitation. The unity of existence is the foundation of all ethical codes. Properly understood it widens the bounds of charity beyond humanity to include the animal world as well. Self love is the mainspring of man’s action and the raison d’etre of his love for others. We learn from Non dualistic Vedanta that the true self of man is the self of all beings. Therefore self love finds its expressions and fulfillment in love for all. The golden rule of Christianity can be rationally understood and appreciated only when it is realized that by hurting others can really hurts oneself and conversely that by making other happy one brings happiness to oneself. Without consciousness of the unity of existence ethics becomes a mere device for makeshift adjustments among conflicting interests and when these interests are at any time seriously threatened the ethical codes down. Without a spiritual sanction justice is in the interest of the strong. The oneness of the Godhead is well emphasized in the statement of the Vedas truth is one but the sages call it by various names. These names honored and worshipped by the various religions are but symbols which enable finite minds to grasp the infinite. The deities they designate are so many facets of the ineffable reality which is one. What is needed is steadfast to one’s own ideal and positive respect not mere toleration for the ideals of others. Religion is not the goal but only a path by means of which the aspirant attains ultimate perfection. Different religions are necessary to suit different minds at varying levels of evolution. All religious are working for the good of mankind. Each religion takes up as it were one part of the great universal truth and spends its whole force in embodying and typifying it. The much sought for universal religion has always been in existence. It runs through all the various religions in the form of God Consciousness which is the foundation of them all. Truth is the thread that holds together the pearls of the different faiths. Therefore religion should emphasize harmony and not dissension unity and not discord love and not hate friendship and not enmity. The introduction that I have written is based on the Vedantasara by Sadananda who probably lived during the middle of the fifteenth century. Important materials have also been taken from the drg-dysya Viveka and Sankara’s immortal Vivekacudamani of discrimination. I have used the English translation of the latter by Swami Madhavananda. All these books are considered by orthodox Hindus to be authoritative treatises on Non dualistic Vedanta. 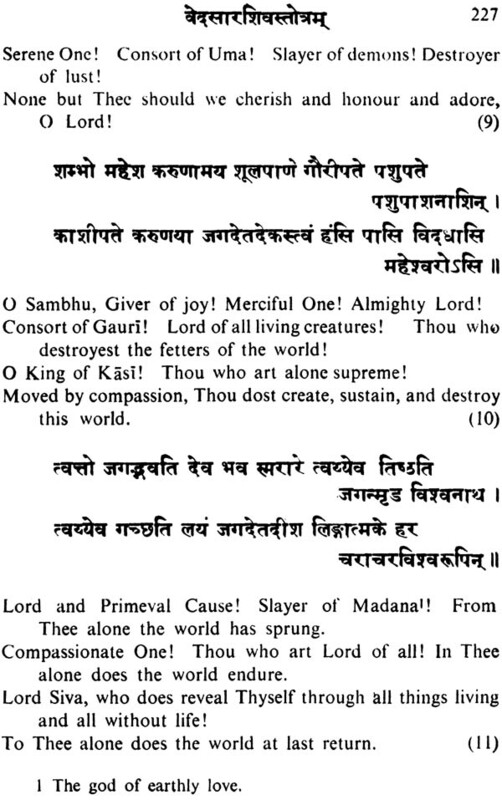 The notes and explanations given with the text are based on the traditional interpretation of Vedanta. Vedanta writers have always used analogies and illustrations to explain their points for the subject matter is of a super sensuous nature and cannot always be adequately explained by reason. These illustrations called from the daily experiences of life help to bring home the truth. I am indebted to Mr. Joseph Campbell for revising and editing the manuscript and to Mr. John Moffitt, Jr. for assistance in translating the hymns given in the appendix. I am also grateful to Swami Satprakasananada for many valuable suggestions. The very name of the book atmabodha or self knowledge suggests its perennial interest and universal value self knowledge is vital. All other forms of knowledge are of secondary importance for a man’s action feeling reasoning and thinking are dependent upon his idea of the self. His view of life will be either materialistic or spiritual according to his conception of himself. It he regards himself as a physical creature and his soul as subservient to material happiness devoting himself to the attainment of power and the enjoyment of material pleasures. Whenever a large number of people follow such an ideal society becomes materialistic and there ensure bloodshed war and destruction. If on the other hand a man regards himself as a spiritual entity and believes that his material body should be utilized to serve a spiritual end then he is spiritual. He follows the path of unselfishness consecration and love and thus becomes a force to promote peace and happiness for all. Therefore it behaves everyone to cultivate self knowledge at all times. Self knowledge serves the practical purpose of destroying pain and suffering and also the positive end of helping everyone enjoy supreme peace and blessedness here and always. A STUDY of the early philosophical and religious writings of the Hindus indicates that the Indo-Aryans, who lived in ancient times in the valleys of the Indus and the Ganges, were keen and thoughtful observers of both the outer and the inner world. One of the things that greatly impressed them was the changeability of everything in nature. Oceans, mountains, rivers; trees, plants, herbs; birds, animals, insects; the sun, the moon, the stars-in short, all animate and inanimate objects-are subject to the law of change. And this is equally true of the states of the mind. Happiness is followed by suffering, joy by sorrow, serenity by restlessness, courage by fear, exaltation by depression. Of every experi- ence, both subjective and objective, it may be truly said, "Even this shall pass away". And so a question naturally was raised: Is change itself the ultimate reality, or is there an unchanging essence, the ground of all change? Like change, suffering too, was observed to be a univer- sal phenomenon. No one escapes its cruel jaws. Rich and poor, high and low, old and young, learned and ignorant, righteous and unrighteous: all embodied beings suffer. Asked by a king about the meaning of life, a sage once replied, "A man is born, he suffers, and he dies." Sorrow, indeed, is the price of our birth on earth. It afflicts a man's body or his mind. It may he caused by other human beings, by the denizens of the animal world, or by such uncontrollable cosmic phenomena as rain and drought, heat and cold, earthquake and storm. Twenty-five hundred years ago a great Indian seer-Buddha, the Enlight- ened One-declared that if all the tears that had flowed from human eyes since the beginning of creation were gathered together, they would exceed the waters of the ocean. The four Noble Truths which he discovered and announced as the basis of his religion are all related to suffering: its exist- ence, the cause of its existence, its cessation, and the way leading to its cessation. Any glimpses of happiness that may seem to brighten our days on earth are both fugitive and deceptive. Every enjoyment is marred by a haunting fear. The rich are afraid of thieves, the beautiful of deformity, the healthy of disease, the learned of rivals, the aristocrats of dishonour, the virtuous of slander. Yet man somehow forgets this truth in the rhapsody of his fear-haunted and momentary happiness. To illustrate the illusive nature of human happiness Buddha narrated the vivid story of a man who, while roaming in the forest, was discovered and hotly pursued by a tiger. He suddenly came to the brink of a deep precipice. The ugly beast was about to pounce. With only a split second for decision, the man perceived a vine hanging down the cliff and, catching hold of it, gave a jump. But the creeper was not long enough to land him on the ground. Looking down, he beheld, just below him, a second tiger, almost within reach, viewing him with glowering eyes. The first, meanwhile, was still roaring at him from above. And then as though his circumstances were not precarious enough, two mice, one black and one white, began to gnaw at the vine that he was clutching for his very life. It was then that he spied a strawberry growing on the side of the cliff, ripe and luscious, and just within his reach. He stretched forth his hand, plucked the fruit, put it in his mouth, and exclaimed with delight, "Ah! How perfectly delicious!" If all our joy on earth is momentary and illusory, what is the basis of the illusion? Can there be illusion without a background or substratum? And how may one put an end to the, suffering and attain peace? Or is there any peace? The ubiquitous presence of death stirred the thoughts of the ancient Hindus. Does death mean the complete annihilation of a man, or is there something within him that survives the destruction of his body? And if death puts an end to the whole man, then why is he born at all? What purpose does one serve on earth, if the flame of life is snuffed out at a tender age? What is the meaning of death and how is it related to life? Is there any way to overcome it? The early Indo-Aryans had an insatiable appetite for knowledge. Nothing short of omniscience would satisfy them. One reads in the Vedas of a disciple who asked his teacher, "What is it, revered sir, by the knowing of which everything in the universe can be known?" Like the Greek philosophers the Hindus first hoped to win knowledge by the analysis of external Nature. Extraordinarily detailed and poetical descriptions of the objects of nature appear in the ancient Vedic literature. But after a time the futility of such an effort to gain omniscience became apparent. One cannot adequately know an infinitesimal part of the earth through the study even of a whole lifetime. And there spread before our vision the sun, the moon, and the stars without number. Presently, however, a clue was found to the solution of the mystery of knowledge. The Hindu philosophers observed that by knowing the nature of clay one knows the nature of everything made of clay, by knowing the nature of iron or gold one knows the nature of everything made of iron or gold. Is there not likewise, they asked, something that is the basic material of the universe, by the knowing of which everything in the universe will be known? The Chandogya Upanishad describes a dialogue between Narada and Sanatkumara, Narada approached Sanat- kumara and said, "Teach me, sir." Sanatkumara said to him, "Please tell me what you know; afterwards I shall tell you what is beyond." Narada said: "1 know the Rg-Veda, the Yajur-Veda, the Sama-Veda, the Atharva-Veda, history and mythology, grammar, the rules for the sacrifices for the ancestors, the science of numbers, the science of portents, the science of time, logic, ethics, etymology, the science of elementals, the science of war, astronomy, the science of snake-charming, and the fine arts. All this I know, sir. But, sir, with all this I am like one who knows only the words, the sacred books. I do not know the Self. I have heard from men like you that he who knows the Self overcomes grief. Do, sir, help me over this grief of mine". San at- kumara said to him, "Whatever you have read is only a name." The search for the Great Cause is linked with the search into the nature of man himself. Is man only a physical being, or has he a spiritual basis? The study of man opened before the Hindus a new vista. How does the mind think? Is the power to think inherent in the mind itself or does another extraneous power impel it to think? What has set in motion the life-breath? Who engages the tongue to speak, and the ears and eyes to hear and see? The ancient Hindus wondered whether there was a First Principle or Ultimate Reality underlying the outside world, and also whether there was such a thing underlying man himself. If so, were the two the same? The gods are later than this world's production. Who knows, then, whence it first came into being? So it was clear to the Hindus that the gods cannot re- move man's ignorance nor show him the way to blessedness and immortality. The problem of Ultimate Reality cannot be solved through study of, or devotion to, anything in the visible outside universe. Other seekers directed their attention to a different world, the inner world within man himself. By means of such spiritual disciplines as severe self-control and con- centration they discovered that the realm of the mind was infinitely more real, interesting, and deep than the realm of gross physical matter. There, after patient search, they at last discovered the clue to the supersensuous truths relating to the Self, the hereafter, man's destiny, and Ultimate Reality.